The new Owyhee County Fair and Rodeo queen hails from Eagle, but her roots south of Snake River run deep. 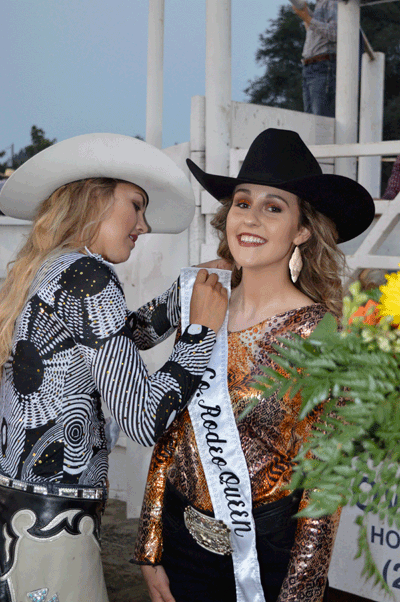 Emma Carley was named the 2018-19 queen during the final performance of the county rodeo on Aug. 11. She received her sash and crown from outgoing Queen Tevis Mashore and will represent the Owyhee County Fair and Rodeo at events throughout the region for the next year. Grand View resident Elizabeth Bearden, a 16-year-old Mountain Home High School student, was runner-up. The 16-year-old daughter of Scot and Carla Carley, Emma has strong ties to the Bruneau area. She’s the granddaughter of Cathy and Chet Sellman. Her great-grandfather is Ray Colyer. Her mother, Carla Sellman Carley, was a champion showman at the Owyhee County Fair, and her cousin showed a steer at this year’s fair in Homedale. Information provided by her grandmother, Cathy, also reflects that she is a descendant of James and Eliza Black, who were among the original settlers in the Bruneau Valley. Emma was named Miss Congeniality in the 2018 Owyhee County Fair and Rodeo Queen contest, and she also won the speech competition. Elizabeth Bearden won the horsemanship award. Her parents are Taft and Kimberly Bearden. Judges for this year’s pageant were Ginger Loucks, Annie Phelps and Lucy Rector.